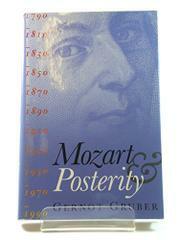  In spite of the sprightly tone, this translation of Gruber's study of Mozart's reception, reputation, and influence, mostly in Germany, is narrow, heavy-handed, and repetitive, lacking the interdisciplinary range and critical sophistication promised by the publisher. According to Gruber, Mozart was neglected during his lifetime because music was not viewed as a serious occupation, but he was venerated in his death. The reputation of the composer's operas and orchestral works then went through various stages reflecting public taste, political or partriotic values, publishing opportunities, and performance. Between 1800 and 1830, he was deified by the Romantics, published and performed in England as well as at Weimar, considered in opposition to Beethoven, whose wild sublimities appealed to a quite different taste. Between 1830 and 1900, he was ``sanitized'' in idealizing biographies, statues, commemorative coins, and festivals. In the 20th century, he was ``commercialized'' and found a new popularity and interpretation from Peter Shaffer's play Amadeus and Milos Forman's movie of it. Goethe, E.T.A. Hoffman, Kierkegaard, G.B. Shaw, Wagner, Strauss, Marc Chagall, Ingmar Bergman, all found their own Mozart, responding to the protean nature of his genius. Admired as a prodigy, depicted as a Roman, as Orpheus, as a favorite of Apollo, or interpreted as the reincarnation of Raphael or Shakespeare, Mozart became a projection of the values and needs of each age, reflecting as much as influencing, responding simultaneously to conflicting critical interpretations. In spite of the methodical surface, the actual focus, thesis, purpose, even character of the text is summarized in the befogged conclusion: ``History as development becomes a metahistory of kaleidoscopic juxtapositions,'' which explains but does not justify the absence of shape, direction, and context in this study. Fortunately, Mozart prevails.